The peaks of Mt Datun are the last high hills before the Danshui River splits the Yangmingshan massif from Mt Guanyin. With the exception of the popular Datun Main Peak they are a little wilder and less visited than the peaks on and around Qixing Mountain. Mt Miantian and Xiangtian are probably some of my favorite hills, both for their views and the unique crater pool on Xiangtian. 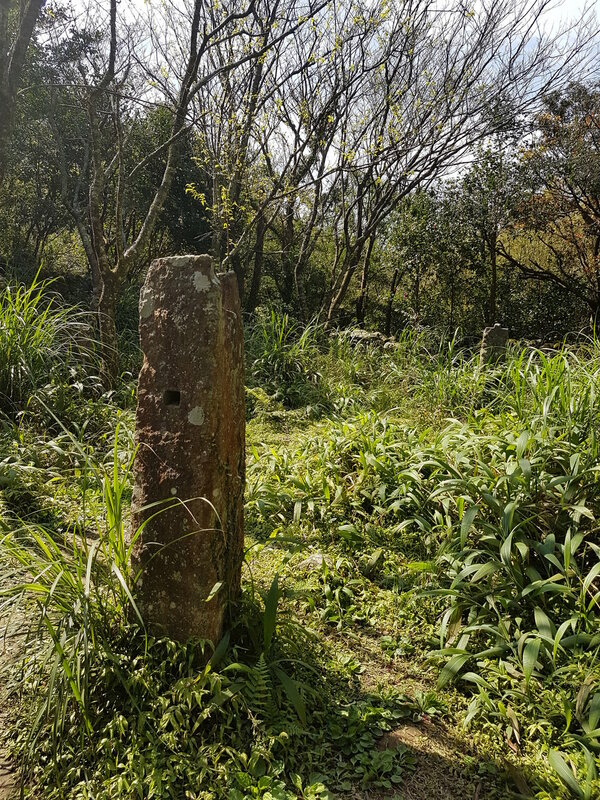 Outside of the ecological protection zones there are no other peaks in Yangmingshan with such a distinct crater shape. It's also one of the few parts of Taiwan that I've experienced total silence in, without even a cicada interruption. There are two ways to get to Mt Miantian. The hard way is over the steep Datun multi-peak trail and a easier route winds through Erziping. From the Erziping stop on the Yangmingshan circular route bus (107) there's a small road that heads to the top of the Mt Datun Main Peak. A short way up the road you can cut across some land onto a stone walking trail. The top of Mt Datun is a cluster of military radar installations. Looking towards some peaks in the east. View towards the Datun West Peak and Mt Miantian. Mt Guanyin is in the distance. It's often a little crowded up here as it's possible to drive to the top. Follow the well-marked trail towards the Datun South and Datun West Peaks. The trail drops sharply into Datunping. The ping in the name here, and in Erziping, means raised valley between peaks. They are usually sheltered areas with stubbly clumps of forest. The route to the other Datun Peaks is steep and could be quite difficult if the ground is wet. There are ropes in place though. As few people venture beyond the Datun Main Peak car park, and signs at the trail entrance warn of tough hiking conditions these summits are often quiet. After the west peak the trail will drop steeply and meet with the path from Erziping. The trail from Erziping was easy enough for my grandmother to do so it shouldn't give anyone else any trouble. It's flat, wide, and mostly paved or gravel. It's popular with families looking for an easy stroll. Erziping itself is a landscaped valley garden with several small ponds between the mountains. It's actually quite beautiful and the pretty lava dome peak of Miantian is framed at the far end. Follow the trail out of the valley to the base of Miantian. From here there's a trail down to a temple above Beitou. A minibus leaves infrequently from there. It's not an amazing trail but if you're beat after Datun then there's your escape route. Miantianshan, which I've roughly translated as 'facing heaven mountain' is a really steep climb. I decided to just sprint it and get it done. Looking up at Miantian.A short but steep climb. The top of Miantian is an ocean of silvergrass. I love the sound of the wind in the silvergrass. A combination of the warm breeze, the sound, tiredness from the climb, and a comfortable position on a bench meant I fell asleep here for some time. I think it's the only time I've fallen asleep on a hike. Below Miantian the northern coastal plain is speckled with farms and graveyards. 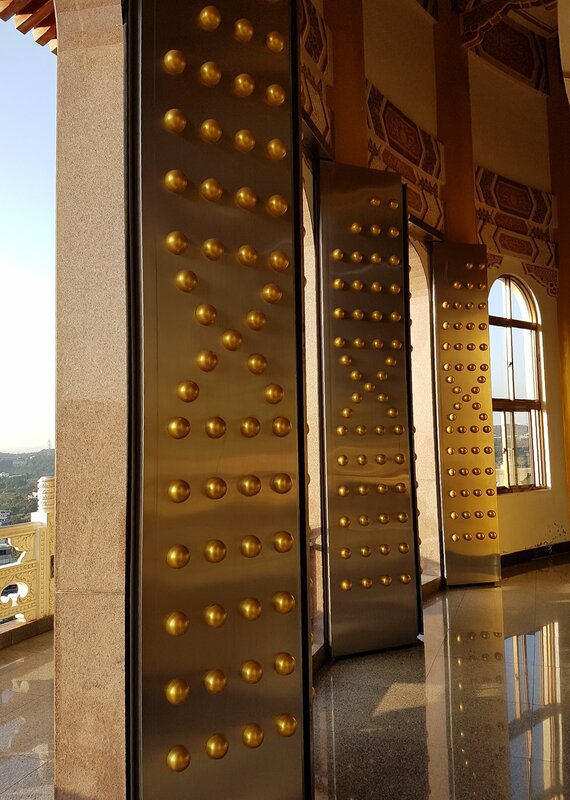 There are a few tall columbarium towers filled with the ashes of the deceased, and some columbarryums, which are towers for the ashes of deceased Barrys. The area is quite an auspicious place for a burial. Mt Miantian and Xiangshan were some of the last mountains to form in Yangmingshan and are about 400'000 years old. They have a strong resemblance to Mt Shamao on the the other side of the park. 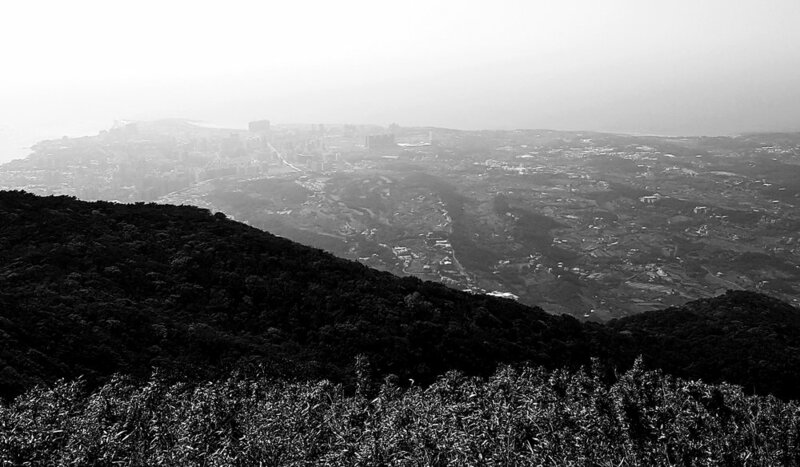 A short downhill path leads to Xiangshan peak. The actual peak of this mountain isn't very impressive, it's just a lower peak on the Miantian volcanic dome, but the main feature here is the crater lake. It was little more than a pond on my visit but this was a good thing; I could walk out on the grass and sit in the sun. As there is no outlet the lake can fill up quite quickly in heavy rain. Apparently small shrimp live in the waters here but I couldn't see any. The crater is also insulated from the wind a little and so very quiet. A more interesting route out can be found in roughly the northeast corner of the crater. 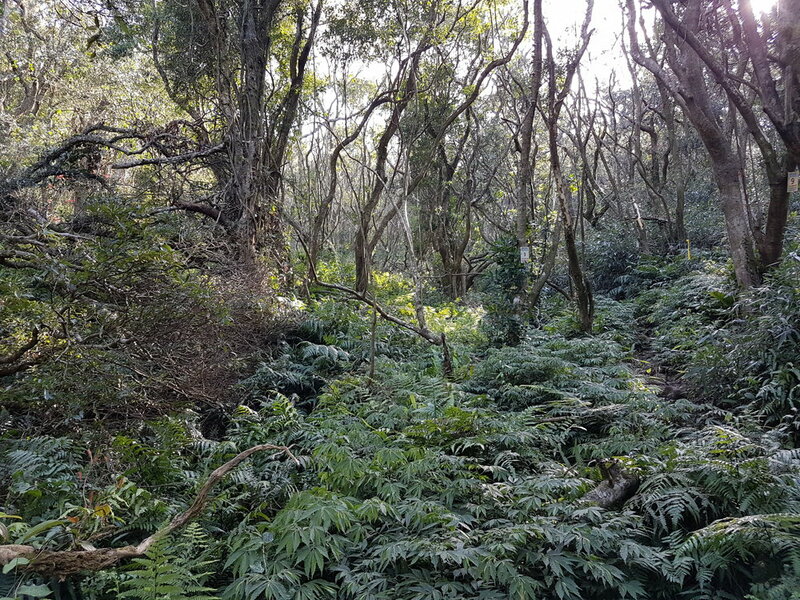 Follow the hiking tags on this steep track down the secluded north face of Xiangshan. In places it's a little overgrown but it's not hard to follow. After a fair while you'll emerge into a hamlet on the north coastal plain. From here take a series of lanes westwards until you can see the Wuji Tianyuan temple below. This temple was founded in 1971 is split into two parts. There's an uninteresting traditional style temple at the entrance and a massive round pagoda tower thing at the rear. The main deity housed here is the Jade Emperor, who is one of the most important Taoist gods. 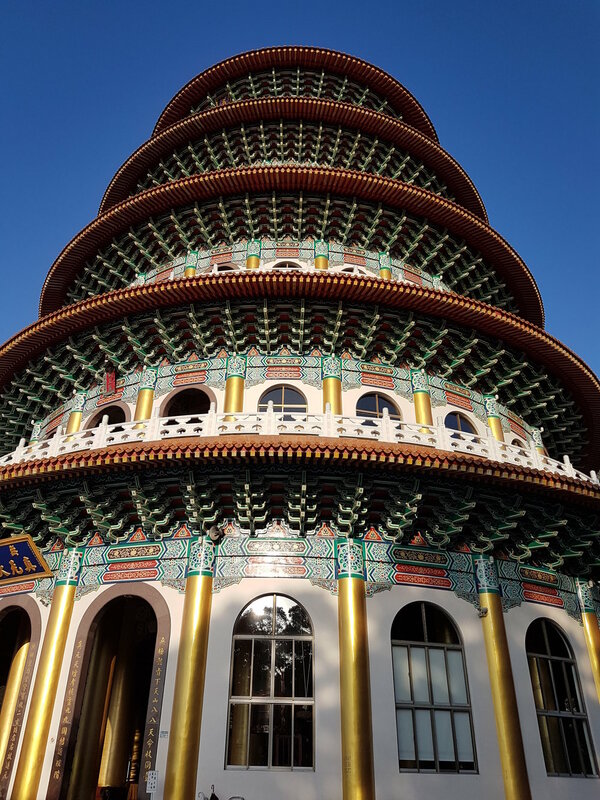 To be honest I spent about a minute at the lower temple and then went straight for the massive round pagoda tower thing. This structure is a lot taller than it first looks, around 65 meters, and it has an opulent shrine on each of its five levels. It's a little more recent than the entrance temple having been built in 1991. It's no coincidence that it shares a rough shape with the famous Temple of Heaven in Beijing. The Tianyuan part of the name also roughly translates as heaven. At the Beijing variant heaven is represented as a circle and earth as a square. That temple also has a square complex at the entrance. The Taiwan variant is a popular spot for viewing sakura and there were still a few trees in bloom when I visited. Apparently this place becomes absolutely packed in the height of cherry blossom season (early spring) so if you want to enjoy it in peace it's best to avoid that time of year. At the rear of the pagoda there are some gardens and a couple of smaller temples. From the temple entrance there are fairly regular buses into Danshui town and the MRT. See the Hidden Taiwan Map for more locations.